HAVIN' FUN IN LEE PRATT'S 41! The first time I laid eyes on Lee Pratt's '41 Buick Sedanette was in Columbus, OH around 1981-'82 at the Street Rod Nats. I had seen it on the cover of no less than five magazines. I lusted for the car. When I first saw it in person I had just walked out of a hotel at night and the flourescent light overhead made the purple metalflake roof dance and come alive. I said to my then 10 year old son, "Chris, this car is the definition of the word soul!" He turned to me and asked for two more quarters to play the video games. He was not impressed, but I knew I wanted to own this car. Lee built perhaps a half dozen notable customs, but this is the one I think is an all-time, all-time classic custom/rod. I say that because technically being '48 or earlier it qualifies as a street rod. But the skirts and hydraulics make it a custom. It is one of those cars that stands out from the crowd and will live forever in custom and rod peoples' brains. Pratt built the car on a budget. He bought the old Buick body for $150, but this car had more style than thousands of instantly forgettable all-the-same street rods that have been built for a hundred times as much cake. It was revolutionary for its time. I think it was one of the first subframed cars. This has got to be the first street rod I ever saw with hydraulics, and perhaps it was the first one ever, anywhere. Lee bought a '65 Buick Skylark, blew the body off and popped the '41 body on that chassis. He cut the frame by the flywheel and stretched the chassis so the wheels lined up in the wheelwells. It had a 300 cubic inch V-8 with automatic, cruise, tilt/telescopic wheel, power seat, McFall tuck n' roll interior, power windows, air...all the "basics". Lee installed a pair of hydraulic pumps, then totally unheard of in his native Des Moines. Lee drove the car from Iowa to San Jose, CA for a car show/vacation. He blew the California boys away. People out there remember the car to this day. Eventually Lee separated from his wife and moved to Southern California. In May '91 I traveled to Des Moines to look at the car. It had been in a fender bender and much of the bottom half of the car was in primer after the sheetmetal was hammered out. The bumpers, grille, and wire wheels were missing and the car was covered with a thick carpet of dust in Betty's garage, where it had sat abandoned for years. I bought the car and had it shipped to New Jersey. The car arrived at LEAD EAST '91 on the top level of an open 18-wheeler car carrier (a portable parking lot). The truck driver had an interesting tale to tell. The hood had not been securely fastened. Half way across PA on Rt 80 the hood suddenly became a kite and flew off the car. Fortunately the truck driver caught a glimpse of this sight in the rear view mirror. He pulled over, ran back, and found the hood sitting in the middle of the highway slightly pranged up, but still intact. It had not gone through anyone's windshield and decapitated them in the process. Nobody had run over it. With a little bodywork we managed to recycle it for another 100,000 miles of use. I had the bottom half of the car repainted deep candy purple by noted race car painter Bob "See you in the movies" Gerdes of Circus Custom Paint in Farmingdale, NJ. They generally don't paint street rods, just race cars, but they made an exception in my case. I had previously flame painted my Selectric typewriter at their shop so they knew me. I managed to keep the original light purple metaflake on the top half of the car. 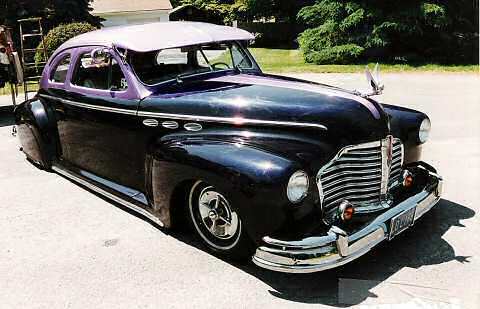 A set of '56 Buick portholes were set into the sides of the hood, concealing the buttons for the electric doors. Briz bumpers were added along with a '41 grille which I think I bought from Egon and had chrome plated. We went through the car from front to back and checked everything from brake shoes to power booster, fixed a burnt valve, replaced a master cylinder, etc. to make sure it was cruiseworthy. On Valentine's Day weekend '91 I drove to Youngstown, OH where a gaggle of pinstripers were having a jam. I left the car overnight and 14 pinheads all striped the car. The coral pinstripe at the two tone purple paint break on the body really popped! In the next five years I easily put 50,000 miles on the car. I drove it to work almost every day. It was garaged from late Nov. to March and I drove it the rest of the time. The people in town knew me as "The guy with the purple car". The Buick, which I called Frunabulax, named after the giant Poodle attacking the power plant in a Frank Zappa song, has been to Maine, to Michigan, to about 5 Street Rod Nats, Carlisle and a zillion car shows. I drove it to Rock Falls, IL to the Midwest Lowriders event. I drove it to Miami and Coconut Grove about three times. Once I left the entry stickers on the windshield until the entire right windshield was totally covered with car show stickers. I've always encouraged car lovers to try wacky, unusual, creative things with their cars. Many people take their car way too seriously, are way too up tight and are afraid to cut loose and have fun with them. Me, I go to the other extreme and sometimes have way too much fun with my cars. People asked me if I was going to put dingle balls in my '41 Buick. I'd done that with my previous '59 Caddy and was well past, through and beyond the dingle ball stage. I felt dingle balls were passe and the car demanded something stronger in terms of a statement. I've always loved the wild, no-holds-barred, creativity of interior work in lowriders. I didn't want to do something in lowrider traditional mirrors and crushed velvet since the car already had a nice McFall tuck n' roll job, which was faded from the years. I felt the interior needed "something" so I took a trip into New York City specifically to attend the Variety Merchandise Show. I walked through 500 booths at the trade show on a quest to find something different, just the right piece of cheap junk, concentrating on earrings from India and/or China. I found purple and white feathered earrings that seemed right for the car and bought about 30 pair of them for $42 total. I brought them home and hung them from the top edge of the window frames, all around the interior. It was a start. There was a fabled guy named Joe "The Fonz" Carloni here in Jersey, reknowned for his rough and crude "Bondo Buckets". Nobody knew it at the time but Joe was the prophet of the coming Rat Rod Movement, but he was decades ahead of the wave. He was a good hearted guy who loved cars but was way short on bucks. He used whatever he could find to decorate his cars, inside and out. His interiors were particularly interesting as they were totally cluttered with kitchy junk. I felt it was time in my evolution to try the Fonzie Approach to Interior Design, (no permanent modifications) using my '41 as the laboratory for this test. The best way to describe this approach is "Too much is better than not enough". On my first trip to Florida in the car I had my "Interior Decorator and Bail Bondsman", the late Reverend Mike Witek from Buffalo riding shotgun. We stopped in Titusville, FL in the Woolworth 5 & 10 cent store and went nuts buying what we think were Hispanic Christmas decorations. I mean Jackpot! Hanging Mirrored disco balls in a variety of sizes plus the mother load, several packages of 50 ft. rhinestones-on-a-string for $1.49 each! Talk about cheap and trashy. I have stretched the truth when I told people that nothing in the 41's interior cost more than a dollar. On to Part 2 of "Havin' Fun in Lee Pratt's '41!"